Definition at line 21 of file PPCInstPrinter.h. Definition at line 30 of file PPCInstPrinter.h. References getRegisterName(), MI, llvm::RISCVFenceField::O, printAbsBranchOperand(), printAliasInstr(), printATBitsAsHint(), printBranchOperand(), printcrbitm(), printCustomAliasOperand(), printInst(), printInstruction(), printMemRegImm(), printMemRegReg(), printOperand(), printPredicateOperand(), printRegName(), printS16ImmOperand(), printS5ImmOperand(), printTLSCall(), printU10ImmOperand(), printU12ImmOperand(), printU16ImmOperand(), printU1ImmOperand(), printU2ImmOperand(), printU3ImmOperand(), printU4ImmOperand(), printU5ImmOperand(), printU6ImmOperand(), printU7ImmOperand(), and printU8ImmOperand(). Referenced by PPCInstPrinter(), printOperand(), and printRegName(). Definition at line 391 of file PPCInstPrinter.cpp. References llvm::MCOperand::getImm(), llvm::MCInst::getOperand(), llvm::MCOperand::isImm(), and printOperand(). Referenced by PPCInstPrinter(), and printInst(). Definition at line 273 of file PPCInstPrinter.cpp. Definition at line 377 of file PPCInstPrinter.cpp. Definition at line 400 of file PPCInstPrinter.cpp. References llvm::MCInst::getOperand(), llvm::MCOperand::getReg(), and llvm_unreachable. 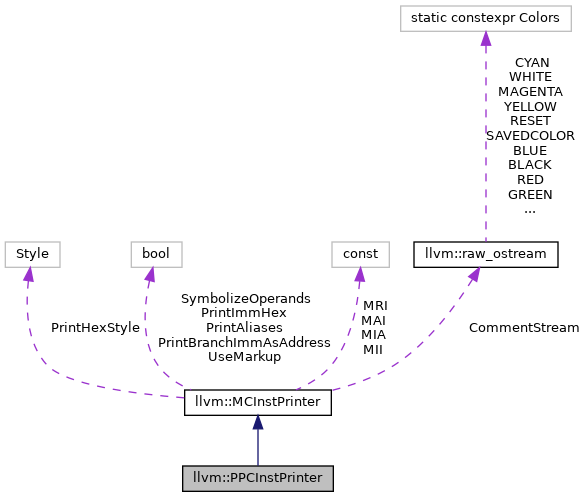 Definition at line 67 of file PPCInstPrinter.cpp. References llvm::MCSubtargetInfo::getFeatureBits(), llvm::MCOperand::getImm(), llvm::MCInst::getOpcode(), llvm::MCInst::getOperand(), llvm::MCOperand::getReg(), OR, printAliasInstr(), llvm::MCInstPrinter::printAnnotation(), printInstruction(), and printOperand(). Definition at line 418 of file PPCInstPrinter.cpp. References llvm::MCInst::getOperand(), llvm::MCOperand::getReg(), printOperand(), and printS16ImmOperand(). Definition at line 429 of file PPCInstPrinter.cpp. References llvm::MCInst::getOperand(), llvm::MCOperand::getReg(), and printOperand(). Definition at line 513 of file PPCInstPrinter.cpp. References assert(), llvm::MCInstrInfo::get(), llvm::MCRegisterInfo::getEncodingValue(), llvm::MCOperand::getExpr(), llvm::MCOperand::getImm(), llvm::MCInst::getOpcode(), llvm::MCInst::getOperand(), llvm::MCOperand::getReg(), getRegisterName(), llvm::PPCInstrInfo::getRegNumForOperand(), llvm::MCOperand::isExpr(), llvm::MCOperand::isImm(), llvm::MCOperand::isReg(), llvm::MCInstPrinter::MAI, llvm::MCInstPrinter::MII, llvm::MCInstPrinter::MRI, llvm::MCExpr::print(), Reg, ShowVSRNumsAsVR, and llvm::PPCRegisterInfo::stripRegisterPrefix(). Referenced by PPCInstPrinter(), printAbsBranchOperand(), printBranchOperand(), printInst(), printMemRegImm(), printMemRegReg(), printPredicateOperand(), printS16ImmOperand(), printTLSCall(), and printU16ImmOperand(). Definition at line 176 of file PPCInstPrinter.cpp. References assert(), llvm::MCOperand::getImm(), llvm::MCInst::getOperand(), llvm_unreachable, llvm::PPC::PRED_BIT_SET, llvm::PPC::PRED_BIT_UNSET, llvm::PPC::PRED_EQ, llvm::PPC::PRED_EQ_MINUS, llvm::PPC::PRED_EQ_PLUS, llvm::PPC::PRED_GE, llvm::PPC::PRED_GE_MINUS, llvm::PPC::PRED_GE_PLUS, llvm::PPC::PRED_GT, llvm::PPC::PRED_GT_MINUS, llvm::PPC::PRED_GT_PLUS, llvm::PPC::PRED_LE, llvm::PPC::PRED_LE_MINUS, llvm::PPC::PRED_LE_PLUS, llvm::PPC::PRED_LT, llvm::PPC::PRED_LT_MINUS, llvm::PPC::PRED_LT_PLUS, llvm::PPC::PRED_NE, llvm::PPC::PRED_NE_MINUS, llvm::PPC::PRED_NE_PLUS, llvm::PPC::PRED_NU, llvm::PPC::PRED_NU_MINUS, llvm::PPC::PRED_NU_PLUS, llvm::PPC::PRED_UN, llvm::PPC::PRED_UN_MINUS, llvm::PPC::PRED_UN_PLUS, and printOperand(). Definition at line 50 of file PPCInstPrinter.cpp. Definition at line 361 of file PPCInstPrinter.cpp. Referenced by PPCInstPrinter(), and printMemRegImm(). Definition at line 310 of file PPCInstPrinter.cpp. Definition at line 442 of file PPCInstPrinter.cpp. References llvm::Triple::AIX, FullRegNames, FullRegNamesWithPercent, llvm::MCOperand::getExpr(), llvm::MCInst::getOperand(), llvm::Triple::getOS(), llvm::MCConstantExpr::getValue(), llvm::MCSymbolRefExpr::getVariantKindName(), llvm::Triple::isOSDarwin(), printOperand(), and llvm::MCSymbolRefExpr::VK_None. Definition at line 347 of file PPCInstPrinter.cpp. References assert(), llvm::MCOperand::getImm(), and llvm::MCInst::getOperand(). Definition at line 354 of file PPCInstPrinter.cpp. Definition at line 369 of file PPCInstPrinter.cpp. Definition at line 282 of file PPCInstPrinter.cpp. Definition at line 289 of file PPCInstPrinter.cpp. Definition at line 296 of file PPCInstPrinter.cpp. Definition at line 303 of file PPCInstPrinter.cpp. Definition at line 317 of file PPCInstPrinter.cpp. Definition at line 324 of file PPCInstPrinter.cpp. Definition at line 331 of file PPCInstPrinter.cpp. Definition at line 341 of file PPCInstPrinter.cpp.